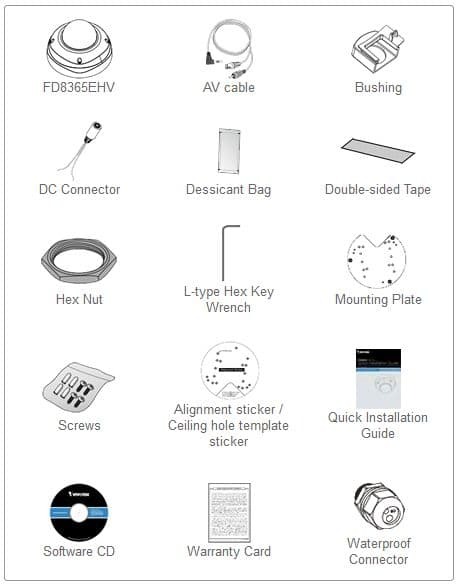 Please Note: The Vivotek FD8365EHV is no longer manufactured, please refer to the Vivotek Dome Camera page for a replacement. The Vivotek FD8365EHV is a smart IR dome IP camera featuring an HD recording resolution of 1920 x 1080 at 30 frames per second in dual stream mode or 1920 x 1080 at 60 frames per second in single stream mode. The Vivotek FD8365EHV provides fantastic image quality by using a 1/2.8" progressive scan CMOS image sensor and a 3 ~ 10mm varifocal lens (33° ~ 104° horizontal angle of view). The IP66 rating of the housing protects the vital components of the camera from harsh weather conditions, humidity and dust. This housing is also IK10 rated, which protects the camera from tampering, acts of vandalism and direct impact. The housing of the FD8365EHV can withstand and remain operational in temperatures ranging from -58°F to 122°F. WDR Pro Enhancement provides extreme visibility in dark or bright environments by combining the brightest part of the image with the darkest part to create one balanced image. Combined with the 3D Noise Reduction Technology, the image noise is reduced and bandwidth is freed up. The Smart IR feature prevents overexposure and automatically adjust the IR intensity based on environmental changes, further reducing image noise and enhancing low light image quality. The built-in IR LEDs have an effective illumination range of 20 meters / 60 feet. Without the use of the IR LEDs, the FD8365EHV has a Color lux rating of 0.42 and a Black & White lux rating of 0.001. 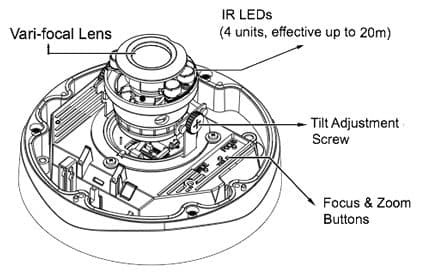 A Removable IR Cut Filter blocks the unusable IR lighting and only allows the visible light to pass through, providing higher image quality. This camera can be powered by 12V-DC, 24V-AC or POE (Power over Ethernet) 802.3af, allowing both data and power to be run over one Cat-5e cable. A Micro SD / SDHC / SDXC Card Slot enables local storage recording of video clips and snapshots. 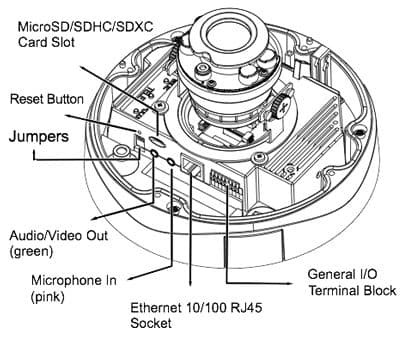 An audio input and output jack allow for the use of a external microphone and speaker for two way audio. The Vivotek FD8365EHV can be integrated with sensors and alarms by using the digital input and output jacks. Like all Vivotek cameras, the FD8365EHV includes a 32 channel central management software capable of managing and recording up to 32 Vivotek cameras. This camera is ideal for outdoor applications that require HD resolution and a impact resistant enclosure.